In August 2017 I joined the #Rooswijk1740 project in Ramsgate, Kent. For me my time there was set to be a two-week project as part of an internship to gain more knowledge and experience within maritime archaeology. I was fortunate enough that I got the opportunity to come back to Ramsgate and have now become an employee of MSDS Marine. 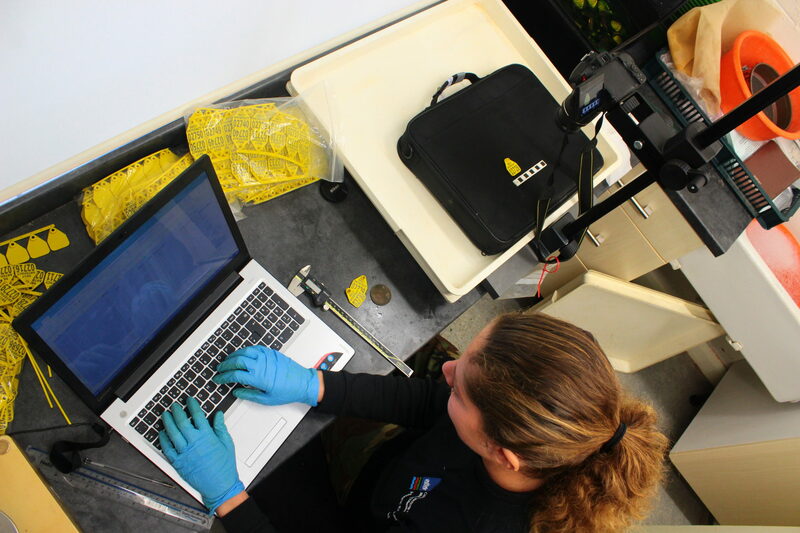 During the project the main task was to assess all of the artefacts that the divers on-board the dive support vessel had recovered from the wreck after carefully recording the find location within the wreck site. The finds that were recovered from the site were registered, put into bags and/or boxes with water and then brought to the warehouse in Ramsgate where they were put in large tanks filled with freshwater ready to be assessed. During the assessment the object, the material(s) and the condition of the artefacts were described, as well the proposed conservation treatment method. Furthermore, the dimensions, weight and other details were recorded. Lastly the artefacts with their artefact number and a scale bar were photographed. I assessed many of the artefacts that were recovered from the site and they provided me with a broader knowledge of artefact types, materials, and understanding of what was onboard a Dutch VOC ship. Alongside the assessment I was trained in 3D recording and I was also able to make 3D models of several artefacts using photogrammetry and a structured light scanner. One of the biggest tasks during my second period in Ramsgate was the excavation of a large concretion from the site which included many different artefacts, such as bar shot, glass fragments, iron chains, rope and a leather scabbard. The de-concretion took approximately two weeks, and after each day a new 3D photogrammetry model was made of the latest stage of the concretion and uploaded to Sketchfab. By uploading models to Sketchfab not only the people working in Ramsgate could see the progress of the de-concreting, but also people following the #Rooswijk1740 project on the Internet. After a few weeks of assessing all of the artefacts (except for the coins, they would be assessed later at Fort Cumberland), all that was left to do was to pack everything carefully into boxes and transport them to Fort Cumberland in Portsmouth where they would be conserved. Together with two other colleagues from MSDS I went to Fort Cumberland for a week, to make a start with the conservation assessment of all of the coins. None of the coins had been fully assessed at this point, as they were kept on board the dive support vessel for security. After one week, several hundred different coins were assessed. Most coins’ date between 1734-1739, but there are several coins that date much earlier too. In the following months I returned to the fort for several days to assess the remaining coins. They were all packed in small plastic bags and put into larger boxes and packed in order. The recording and assessment process required the specific name of the coin, the condition, recommended treatment, weight and diameter to all me recorded. This had to be done for over 1200 coins so was quite time consuming! The excavation of the Rooswijk was the third and biggest project I have been part of after my graduation in June 2017. I have always been really interested in the Dutch VOC and to be part of the #Rooswijk1740 project team was therefore really special. As an early career professional I learnt many things. Not only gaining experience in maritime archaeologist, where you have to be responsible for the finds and the documentation, but also to be part of a big team with many different people and nationalities. Communication is the most important thing with working in a big team and this helped solve many things. Furthermore, I have a better understanding of how much trading goods and personal effects were carried on board a ship and how people must have been living on board. Besides the practical and research work, it was wonderful to see how many people were interested in the excavation of the Rooswijk. During every open day hundreds of people came in and asked many questions and seemed very interested in the work that was being done on the Goodwin Sands. A special open day for home-schooled children was organised as well, everyone was really excited and the kids asked many interesting questions. It was great to see how new technologies, such as Virtual Reality, make wrecks and artefact seem more realistic and how this can engage and enthuse people about archaeology.